*Mail addressed to our physical location will not be delivered by USPS. Please be sure to use our Mailing Address for any items sent via USPS. If traveling north on Interstate 5 (coming from downtown San Diego), take the Del Mar Heights Rd exit. Turn right onto Del Mar Heights Rd. and left onto El Camino Real. Travel approximately 1 mile before turning right onto San Dieguito Road. Travel approximately 4 miles on San Dieguito Road. Turn left off San Dieguito Rd. onto Helen Woodward Way at the Helen Woodward sign, just after the Mobil station and before you reach the light at El Apajo Road. 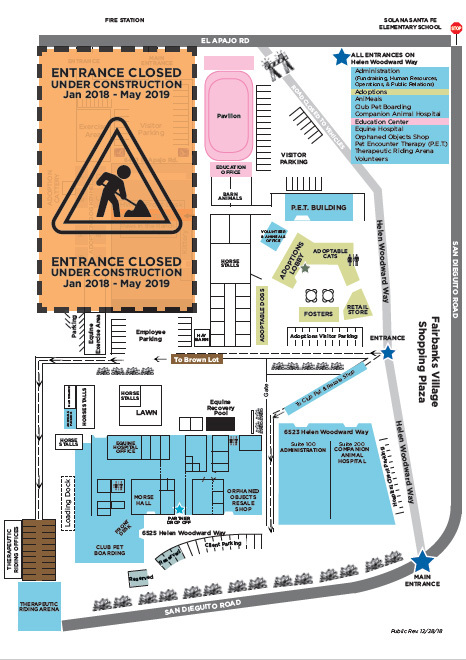 See map on this website for parking and directions once on-site. This is the only entrance open for the Center during construction of our new Adoptions Center in 2018. If traveling south on Interstate 5 (coming from Oceanside), take the Via de la Valle exit. Turn left onto Via de la Valle. At the fourth light, turn right onto El Camino Real. Turn left onto San Dieguito Rd. If traveling north on Interstate 15, take the Poway Road/Rancho Penasquitos Blvd. exit. Turn left onto Rancho Penasquitos Blvd. Follow the signs to take Interstate 56 traveling west. Exit onto Camino del Sur. Turn right onto Camino del Sur and travel through Santa Luz until you reach Del Sur properties. Turn left onto San Dieguito Rd. Drive to the stoplight at El Apajo Road. Continue straight through the stoplight and turn right at the first street which is Helen Woodward Way at the Helen Woodward sign. See map on this website for parking and directions once on-site. If traveling south on Interstate 15, take the Valley Parkway exit in Escondido. Turn right onto Valley Parkway and continue for approximately 10 miles as it turns into Del Dios Highway. Turn left onto Via de la Valle. At the first light, turn left onto Calzada del Bosque. At the dead end, turn right onto Via de Santa Fe. Stay on the road as it curves to your left and turns into El Apajo Road. 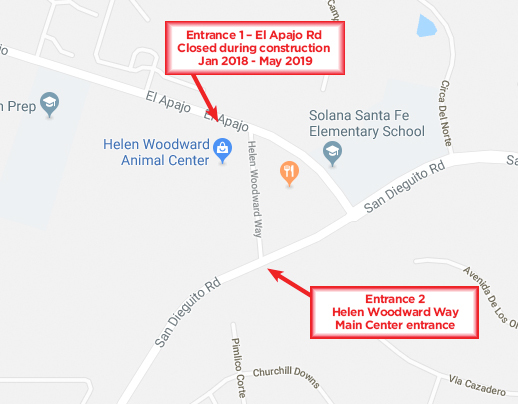 When El Apajo Road ends, turn right onto San Dieguito Rd. and right onto Helen Woodward Way at the Helen Woodward sign. See map on this website for parking and directions once on-site. HOURS: Monday–Friday: 7:15 a.m.–5:30 p.m.
Tours offered daily 12 p.m.–3 p.m. HOURS: Monday–Friday: 8 a.m.–6 p.m.
Saturday & Sunday: 8 a.m.–4 p.m. HOURS: Monday–Friday: 8:30 a.m.–4:30 p.m. HOURS: Monday–Friday: 7 a.m.–4 p.m. HOURS: Monday–Friday: 9 a.m.–5:30 p.m. HOURS: Tuesday–Friday: 8:30 a.m.–5 p.m.
Saturday & Sunday: 8 a.m.–4:30 p.m. HOURS: Monday–Friday: 8:30 a.m.–5 p.m.